Have your toes lost their loving feeling? Instead of comfortable support, do your feet feel itchy? Is there rough or cracked skin between your toes? Or worse – do your feet feel like they burn even when you aren’t having an awesome cardio session? These are good indications that there may be an underlying foot fungus issue happening to the often sensitive skin of your feet. Sometimes a foot fungus issue involves the toenails more than the skin of the foot and may not produce any bothersome symptoms – but is still an issue that must be addressed so your feet can feel nice. Toenails that curl inward from the sides, are turning yellow, are becoming thicker, or may be consistently brittle could be the result of a fungus. In most instances, a fungal infection of the feet is not a serious problem… as long as you treat it. If foot fungus is left untreated, there is the possibility of an athlete’s foot problem moving from the toes to the entire foot. Cracks in the skin can grow deeper and cause painful, bleeding sores. Toenails can stop growing and may eventually die. Knowing how to get rid of foot fungus quickly will help you be able to take proactive measures to make sure your feet are happy and comfortable every day. What can you do today to begin treating a foot fungus issue? Here are some practical ideas that you can implement immediately. Change your shoes. Footwear contributes to the development of foot fungus by providing it the dark, moist environment it likes. Most shoes create heat around the foot because there is no real air flow that can reach your toes. This causes sweating and if there is a foot fungus around, it’s going to start a party with those conditions. Find a breathable shoe that keeps your foot cool, go barefoot if you can, and use orthotics that are specifically designed to remove moisture for best results. Wear socks. Wearing shoes without socks causes the moisture from your sweat to remain around the foot for a longer period of time. This increases the risk of athlete’s foot forming. Throw on a pair of cotton socks and you’ll instantly reduce that risk. Keep your toes dry. If wearing socks isn’t keeping your toes dry enough, then consider placing some facial tissues between your toes. It feels a bit strange to do at first, but the moisture will be removed from the places on the foot where the fungus likes to grow and that lowers your risk of an infection. You will need to change out your tissues 4-6 times per day. Get some sleep. When you’re tired, you begin making eating choices that may not be so healthy. Your body wants fast energy, which means you choose the Twinkies over the salmon. A poor diet can contribute to a fungal infection, but so can being sleep deprived. Less sleep means less strength for your body’s immune system. If you can’t get 6-7 hours of sleep each night, start the day by taking a comprehensive multivitamin to lessen cravings. Become more active. Your feet invite athlete’s foot infections simply because of their location on your body. Your circulatory system can struggle to reach down to your toes effectively, which means toxins that would normally be removed get to linger. What does that fungus do? Feed on that bad stuff. Being active will increase the strength of your circulation system to reduce the risks of this issue. Find a great OTC medication that will treat your foot fungus. If you even think that you might have the start of athlete’s foot, then treat it – unless your doctor says otherwise. There are several different over-the-counter medications that can help you receive fast relief of any potentially bothersome symptoms. These are the 5 most common options that are readily available. Lotrimin Ultra. You might also see it marketed in generic form as Butenafine. Lotrimin AF. This is also sold generically as Clotrimazole. Desenex. This product is also known as Miconazole. You might see it sold under the brand name Zeasorb as well. Lamisil AT. This is also known as Terbinafine. Tinactin. This is Tolnaftate in different concentration levels. If you use an OTC medication, then follow the instructions that are printed on the container. With consistent application, most people can see athlete’s foot begin to heal in about 7-10 days. There may be side effects associated with the medication, so be sure to thoroughly read any informational inserts that come with the product. Although rare, these OTC foot fungus medications may also interfere with certain pharmaceuticals – your doctor or pharmacist can let you know what you’ll need to know about for your health. Talk to your doctor about the issue. If you do not see any improvement in your athlete’s foot or other foot fungus issue in 14 days with treatment, then it’s time to see the doctor. You might also consider an appointment if your athlete’s foot is spreading rapidly up your foot for some reason. There are several prescriptions that are available and results can often be seen in 2-3 weeks. Stop the potential of spreading the infection. Certain substances can help to spread athlete’s foot to other parts of the body. Anything you apply to your foot or nail that isn’t an anti-fungal item has the potential to spread the infection. For this reason, you’ll want to avoid using things like nail polish until the athlete’s foot resolves. Use a home remedy treatment. If the pharmacy isn’t close to your home and the idea of spending a couple hundred dollars at the doctor for an assessment isn’t appealing, there are some home remedies that have shown to be effective at stopping athlete’s foot and under fungal infections. Consider giving these a try. Vinegar. Because vinegar is acidic, the liquid will help to kill of the foot fungus when it is given enough exposure. Some people with sensitive skin may find that a vinegar foot bath is bothersome, but for the most part this home athlete’s foot treatment is well-tolerated. You can do a straight vinegar bath or dilute it with one-part vinegar to two-parts water. Garlic. It might make your feet smell bad, but a compound in garlic called ajone has been shown to be effective against an athlete’s foot infection. You can either crush several cloves of garlic in a bit of olive oil or purchase minced garlic from the store and then place the garlic into a warm foot soak. Keep your foot soaking for 30+ minutes for best results and do this twice per day. Starch. You can put the starch in your socks or directly to your foot in the morning. The starch helps to soak up the extra moisture that may be feeding the athlete’s foot – but if your foot is itching, this won’t help with that at all. Any starch works well, but cornstarch, tapioca starch, or rice starch tend to work the best. You can also check out these 10 natural remedies for Athlete’s Foot from Global Healing Center for more ideas. Limit your potential for exposure. Wearing flip-flops in the shower is highly recommended to prevent an athlete’s foot infection. Any shower that is intended for public use could be the home of a potential fungal infection. This includes hotels, pools, and campgrounds in addition to the gym. My Doctor Wants to Remove My Toenail – Now What? Whether there’s a nail bed fungal infection or just a really bad case of athlete’s foot, some doctors may choose to surgically remove an infected area instead of treating it. This isn’t a common treatment option and is usually reserved for infections that don’t respond to other treatments, such as applying high doses of Tinactin in combination while taking proactive prevention measures. Toenails that are removed are generally quite yellow and extremely thick. They will be difficult to trim at home with clippers, even after a long period of soaking. The toenail remove is generally done as an outpatient procedure at a specialist’s office. A local anesthesia will be administered around the nail so the area is numb and then the entire nail will likely be removed. An anti-fungal medication or prescription medications may be ordered after the procedure to prevent the nail from growing back as thick and yellow as before. It generally takes 4-8 months for this procedure to be effective. Are There Other Ways to Stop Foot Fungus? If your athlete’s foot signs and symptoms have eased, but you’re still dealing with a toenail that looks or feels strange, then there is a good chance that you’ve developed a nail infection. Athlete’s foot that remains untreated can also become a dual nail-skin infection. When this happens, you can apply a product like ClearNail Pro+ with your athlete’s foot creams or prescriptions to receive a total treatment package. Tea Tree Oil is another method that has become popular to stop a bad case of athlete’s foot. Many “natural” or “homeopathic” products that are designed to fight a foot fungus contain this ingredient. Before selecting a product with Tea Tree Oil, you’ll want to look at the actual concentration of the ingredient to make sure it is right for you. A 10% application is considered to be as effective as an OTC medication to clear up surface-level athlete’s foot infections. A 25% application is necessary for an athlete’s foot infection that is accompanied by a toenail or nail bed infection. A 100% application is necessary for moderate-to-severe fungal infections of the foot. 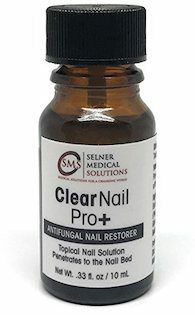 Products like ClearNail Pro+ are designed to treat a nail infection only. You will want to use this product in conjunction with your preferred skin infection product to receive the best possible results. Let’s talk about urinating on your feet. Many veterans were told during their initial military service orientation to urinate on their feet in order to prevent athlete’s foot. Many people have a grandmother who likes to tell the story of how she would pee on her hands to keep them nice and clean. Urine therapy has its own pros and cons. The idea of soaking your feet in a bucket of your own urine for 15-30 minutes is just not appealing to some people. To reduce the gag factor, some folks will mix their urine with hydrogen peroxide as a treatment for athlete’s foot. Many report that this has been an effective alternative treatment for this fungal infection. But let’s be clear about this treatment option – just urinating on your feet in the shower will be ineffective. The foot must be soaked in urine for a period of time for the infection to be potentially reduced. It can be effective because urine is typically slightly acidic, making it similar to placing your foot into a vinegar bath. Are You Ready to Stop Your Athlete’s Foot Problem Today? There are many options available for you today to begin treating an athlete’s foot infection. It is important to start treating it immediately so that a surface skin issue doesn’t become a nail issue as well. Use OTC medications, at-home treatments, or your preferred treatment method from this guide to stop the itch before you begin to feel the burn from this fungus. You can also use a product like ClearNail Pro+ to work with creams and sprays, as well as some prescription medications, to treat difficult athlete’s foot infections that have spread. Be sure to speak with your doctor about any medications, supplements, and at-home treatments you are using as well so the best possible treatment plan can be created for you. With ongoing treatment with the products found here or with prescription-strength items, you can begin to see results in just 7-10 days in many instances. This means you can finally tell your athlete’s foot to go away and then stay away for good. Why wait? Get started today so that your feet can be happier every day because they are fungus-free. I use to have foot fungus on multiple toes on both feet. At the time I didn’t know any treatments for it but one day I seen an episode of survivor man and he was urinating on his toes because he had foot fungus. I tried this annnd let me tell you something after about 2-3 weeks of doing that every time I showered my fungus ceased. Well that sounds very hygienic… I think I will stick to a vinegar soak! Who cares? You’re in the shower. But it doesn’t work. I don’t know what’s in your pee. Forget about hygienic, urine is”sterile” to body since it was in the body, filtered by your body and part of your body.owing to multiple micro organisms in it which anyhow are always inside ones body; it BECOMES not so sterile after some time.can be anomaly to distilled water, of vinegar is anomalous to bottled water. Fresh urine is sterile. There is nothing unhygienic about it despite our ingrained cultural programming that says otherwise. Our body makes antibodies to any pathogen it encounters. Some of these antibodies are released in our urine. Why waste perfectly good antibodies! Urine is helpful when applied on many skin rashes. Another effective home remedy for fungal infections (plus many other issues) is applying coconut oil a few times daily. Add some tea tree oil to the coconut oil for a double whammy. Like you say Urine comes out stetile, but once it is introduced to the outside you may encounter a host of problems, no pun intended. That is one alternative but I will stick to the vinegar and peroxide. It’s very hygienic, urine is sterile. Do your home work before you type. I have tried tea tree oil vinegar. Food grade hydrogen peroxide. Oregano78 oil. All of this straight ar various times and nothing works. OTCs don’t do anything. Idk, I have had it for over two years now. Toenails are fine. It just stays on One foot. Near toes and doesn’t go any further then where they join together. Burn itches peels between toes and warm water makes it hurt the warmer the more painful. Is this a typical foot fungus. I have never had Any kind of fungus before …. Sounds like it might be foot fungus. Generally this can be cleared up with an over the counter topical ointment and making sure that you clean any surfaces and shoes that you use, to prevent reinfection. If you’re not having any success with the OTC options, please consult with your doctor. I had toenail fungus on just one toe & was having anyone see my horrible nail! I tried Kerasil for months…no change. Then, I read about using Vick’s VapoRub…I used it twice a day (morning/bedtime), rubbing it in well. My fungus is completely gone (but it didn’t happen overnight) & I am no longer embarrassed by that ugly toenail! funny you say that… i began using vicks vapo rub on the bottom of my feet because they were always so dry and ached at the end of a long day. keep in mind i had some foot fungus going on also… OTC wasnt doing anything, i gave up temporarily. So every day i was applying the vapo rub on my feet so my feet wouldnt hurt and Lo and Behold it has been helping to clear up my foot fungus too. initially its a gel kind of substance but the menthol in it helped to keep my feet dry from sweat by evaporation or, idk what im just glad it works! I have hot burning tight skin on my toes. Spots that have sores..oozing clear and yellowish liquid!! If you squeeze it white cottony fuzz comes out with the sticky odor. Nasty skin peels off the pain so intense you want to throw up! Then the swelling got so bad the would split when I walk. A big white seed comes out. OMG!! It hurts is this athletes foot? Sounds like you have planters worts! I hated those things. I had them about 10 years ago and I had to go to the doctor 2-3 times a week and they would cut them open and burn them with acid. Burned like hell for about an hour, but they eventually went away! Good luck!!! What some r describing sounds like eczema. I thought I had fungus & it is eczema. My Mom is suffering from big toe toenail and half foot fungus. Been following the ideas on this site for about 4-5 days. Only slight improvement. I am doing the ACV foot baths and Epsom Salt foot baths. One thing I would NOT recommend is wearing socks. Socks can actually cause more sweating than wearing nothing. Since I had my Mom switch to NO socks and wearing flip flops or soccer slides, her fungus issue is healing much more so. The foot baths are showing signs of improvement, but only minimal.